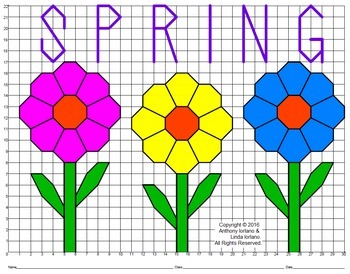 This coordinate graphing project is fun for the student and makes a great bulletin board idea as well. 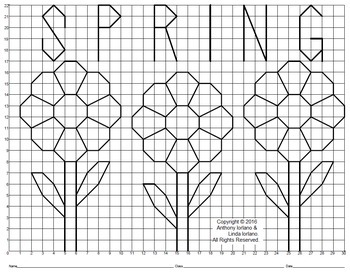 Students will use their knowledge of coordinate graphing and ordered pairs to work creating drawings of spring flowers. This will be created by plotting ordered pairs and then connecting them with straight lines. 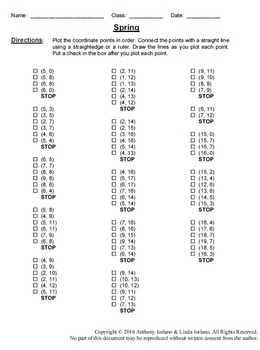 This activity can be a class project or something to be worked on independently when time allows. It also works as an extra credit assignment or when there is a substitute teacher. The graph consists of points in the first quadrant using ordered pairs with whole numbers only. When finished, they can use markers, colored pencils or other medium to enhance the project. 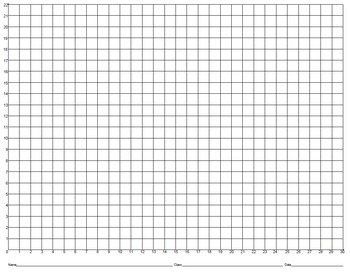 * Details for Plotting Coordinates with Fractions in All Quadrants. If you like this project, please let us know. There are many projects covering the entire school year and some projects are cross curricular (Sports, Patriotism, Seasons, Holidays, History, Landmarks and Science). Lessons begin at 2nd grade and are appropriate for the Elementary School, Middle School and some for High School students. These projects have been used successfully at both the Elementary and Middle School levels.